tags: 3d items, Birthday card, Female Card, Online Shopping, Stampin' Up! Today I am going to share with you a card and matching gift bag I made for a friend who celebrated her birthday while I was away. I came home from my holidays to a big box of goodies from the new catalogue. 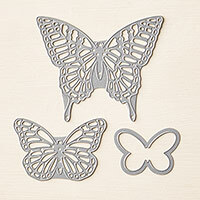 So I was happy to use a new stamp set called Watercolour Butterflies to create my gift. This is a two-step or three-step stamp set, so you can create some really gorgeous images. 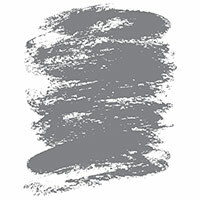 I started by stamping the Watercolour Wash Background stamp onto Whisper White card using Sahara Sand ink. I attached the stamped Whisper White card to scored and folded Sahara Sand card. 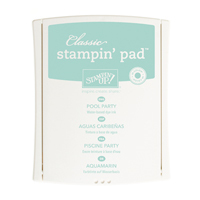 I stamped the large solid stamp using Pool Party ink onto Whisper White card. The outline of the wings is stamped using Bermuda Bay ink and the centre of the butterfly is stamped using Island Indigo ink. I created two flowers so that one could be cut using the outline framelit from the Bold Butterfly Framelits and one was cut using the detail butterfly from the Butterflies Thinlits. Once I cut the images, I stamped the butterfly body using Island Indigo ink. I attached the solid image to the lower left hand side of the card front and then stamped the antennae using Island Indigo ink. The detail image is attached using Glue Dots on top of the solid image, so that the wings can have some lift. 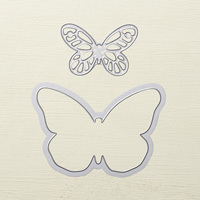 I created a smaller butterfly by stamping the solid butterfly onto Whisper White card using Wisteria Wonder ink which is stamped onto scrap paper first. The outline of the wings is stamped using Wisteria Wonder ink without stamping onto scrap paper and the centre of the flags owner is stamped using Elegant Eggplant ink. 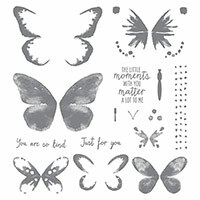 A second small butterfly is created by stamping the solid image using Delightful Dijon ink, the outline of the wings is stamped using Hello Honey ink and the centre of the butterfly is stamped using Cajun Craze ink. Again a solid and detail butterfly image was created using the Bold Butterfly Framelits and the Butterflies Thinlits. The Wisteria Wonder butterflies body was stamped using Elegant Eggplant ink and the Delighful Dijon butterfly body is stamped using Cajun Craze ink. After the solid butterflies were attached to the card front I stamped the antennae use Elegant Eggplant and Cajun Craze ink. The detail butterflies were attached over the solid butterflies using glue dots in the centre so that the wings can be lifted. I added Basic Rhinestones to the centre of each butterfly. To decorate the inside of the card I stamped the dotted image across the lower left hand corner of Whisper White card using Sahara Sand ink. I created two more small butterflies using Daffodil delight, Delightful Dijon and Memento Tuxedo Black ink. The butterfly body and antennae are stamped using Memento Tuxedo Black ink. The greeting from the Sassy Salutations stamp set was stamped using Memento Tuxedo Black ink. To decorate the gift bag I created one large and three small butterflies using the same color combinations as I used for the card. The butterflies are attached in the same manner as they were for the card. I love how both the card and the bag turned out. What about you? Do you love them too? from → 3D items, Birthday Cards, Butterflies, Female Cards, New catalogue, Shop online, Stampin' Up!